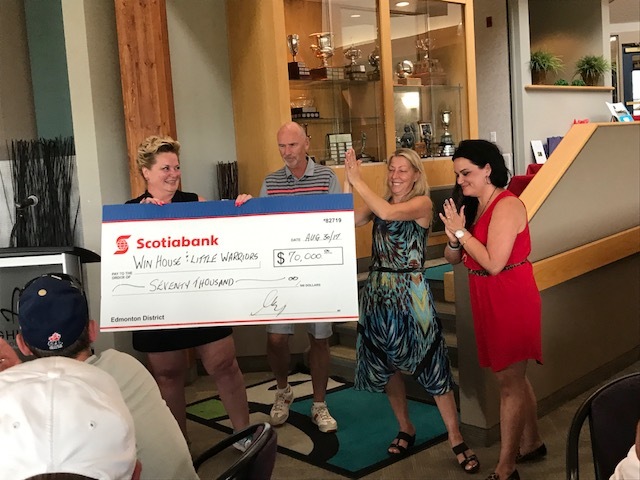 On Wednesday, August 30, 2017 Scotiabank held their Annual Charity Golf Tournament in support of both WIN House and Little Warriors. The event this year was again held at the prestigious Highlands Golf Course in Edmonton and had a full roster of participants including 144 golfers and dozens of Scotiabank volunteers. All proceeds from this year’s tournament, including a silent auction, went to both WIN House and Little Warriors. In total, $70,000 was raised for WIN House and Little Warrior to support our programs and services for the women and children we serve daily. This year the Scotiabank Charity Golf Classic reached an important milestone – its 20th year of making a real difference in our community and at WIN House. In fact, since the Scotiabank Charity Golf Classic began in 1999, participants have helped to raise over $1 million! Quite an amazing feat of generosity and belief in what we do at WIN House and our mission to end domestic violence. The proceeds from the tournament will ensure that we can continue to offer help, hope, and healing to families affected by domestic violence in our community. Attendees for Scotiabank this year was Don McEwan, Vice President Edmonton District; Brian Porter, Vice President Central Alberta District; Denise Unger, Vice President Northern Alberta and; Brent Sybe, Vice President of Scotia Private Client Group. The coordinator for this event was Connie Biel, Branch Manager, Sales & Services, for Ottewell Scotiabank in South East Edmonton. Thank you all for being champions for our vision of ensuring women and children are safe and free from abuse in their environments & relationships. We hope to see you again next year!